The sun only very briefly showed itself during its rise over this haikyo cement plant. 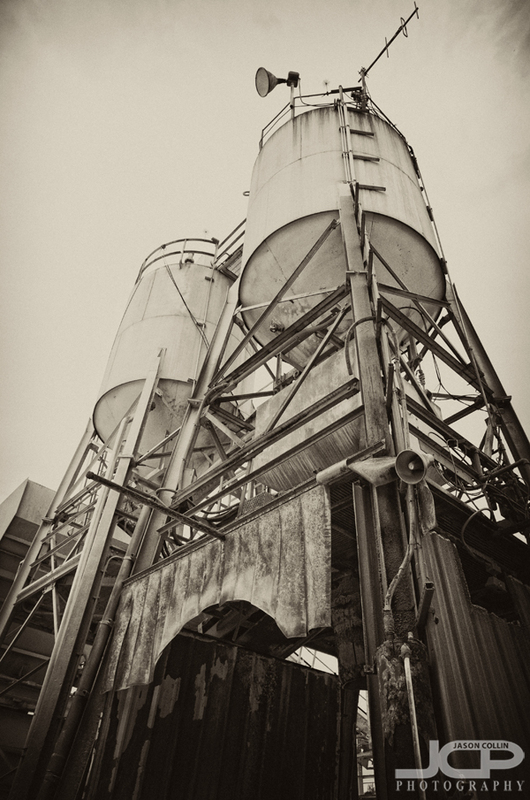 I woke up at 7am Christmas morning, not to open up presents, but to rush off to photograph a cement plant haikyo! After having an entire photography exhibition of urban exploring images I made in Japan at a gallery here in Saint Petersburg, I was getting anxious to photograph one for real (I had visited two other haikyo briefly) in sunny Florida. As my luck would have it, the sun was only out for a brief few minutes before it rose back up into heavy overcast. Fortunately, I stopped by this haikyo the previous evening also and caught the last vestiges of sunlight in a few quick shots. This is something else I had been wanting to do for awhile--photograph a location at different times of day. 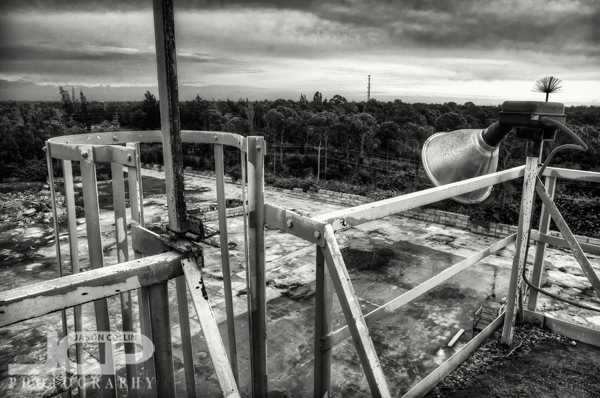 I was hoping to have more blue sky urban exploring images like this one, but Florida's weather has been very poor this December. While visiting my Mom over Thanksgiving, I happened to notice a decaying driveway with a meager bar gate leading into the woods. I stored it in my mental archives as a possible haikyo location to check out on my next visit. At that time I thought it might be a housing subdivision that never got completed, so I was a little surprised to find a cement plant behind the tree line. Some of the plant's product was stacked into neat walls that reminded me of ancient Rome. I was not alone on my late afternoon visit. Kiki came with me. I could not let her wonder off alone so I had to keep one hand on her leash leaving only one to hold my Nikon D300 for shots like the above one. I tried to get Kiki to follow me up the conveyer belt seen in the above photo, but the metal mesh type ramp was not something Kiki, though quite brave, was willing to traverse. However, when I went back by myself at sunrise the next day, I made the steep stroll to its summit and realized it was definitely no place for a dog! It was fun to walk up alongside that conveyor belt, not scary like it was climbing the steep ladder to the point from which I made this photo. This cement plant in my estimation has not been closed down for that many years, maybe only 3 or so. There was really only one building with an interior, but that was locked up tight as a drum and I did not feel breaking in was prudent to just photograph the few desks and filing cabinets I could see through the locked door's window. 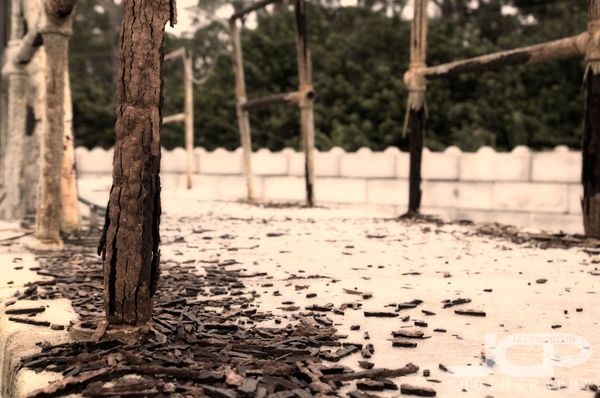 Thus, there was not a high level of decay to photograph. I do not know if I would have climbed the metal rung ladder to the top of this tower if it did not have the pictured cage safely enclosing it. What did excite me about this haikyo though, as young as it was, is that it meant I could break one of the main rules of urban exploring, which is, "do not climb anything." 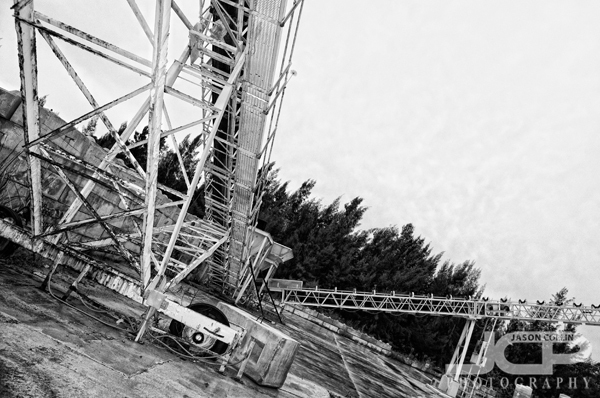 There were a couple towers and two high conveyor belt ramps to climb. The photo above was taken after I climbed a three tiered vertical metal rung ladder jutting from the exterior of the tower. Only the bottom two rungs had any rust on them at all. Plus the protective cage around the rungs made me feel pretty safe, though it was a bit of a tight squeeze with my Lowepro backpack on and another small shoulder bag dangling in front of me. I doubt anyone larger than me could have fit with a backpack on. The vertical climb up the rungs was something I am not physically accustomed to doing only a short 20 minutes after first waking up either. I was in a race though because I knew the bit of sunlight peaking through would soon vanish as the sun rose into the overcast morning sky. Top: roof of the highest tower Bottom: entrance to the highest conveyor belt, never even thought to take the fast way down! After climbing the tallest rung ladder, I went right to the ramp to the highest conveyor belt. It definitely took some physical exertion to get my increasingly large carcass and all my camera gear to the tops of both places. I always like having a view though. These railings showed the greatest level of decay of anything at the cement plant haikyo. Once I got off the top tower, the sun was gone and it was a very grey morning. Back on the ground there was also little left around the plant itself other than the towers and various silos. Got to have shades & a BBQ grill if it's Florida! 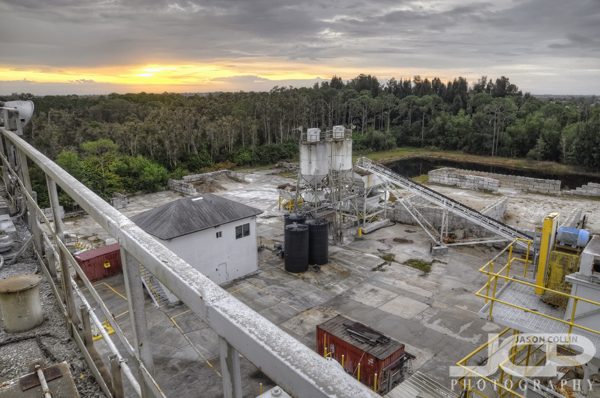 However, I did find signs that this was definitely a true Florida based cement plant. Safety equipment included the usual orange vest and hardhat, but also another definite necessity for Florida, a good pair of dark sunglasses. It also would not be any kind of Florida outdoor space without a BBQ grill either! I did not climb these towers as they were showing more signs of decay than the others. This cement plant was more of an architectural haikyo rather than an exploring haikyo as the majority I have been too were. Thus, it did not feel as personal as there were no dark corridors to walk down with surprises around corners. Nothing to open up and look inside of. I guess cement blocks slid down these conveyor belts, but I did not carry one to the top to find out. Still, it was good to walk around a place that no one has for years and to at least make the effort of rising at dawn to try and find some unique light, though unfortunately this time there was none. If anyone knows of any other haikyo or abandoned buildings, factories, farms, etc, in Florida please let me know in the comments below.